During the late eighteenth and early nineteenth century, when European artists were influenced stylistically by the art of ancient Greece and Rome, they also focused on subjects from classical literature. 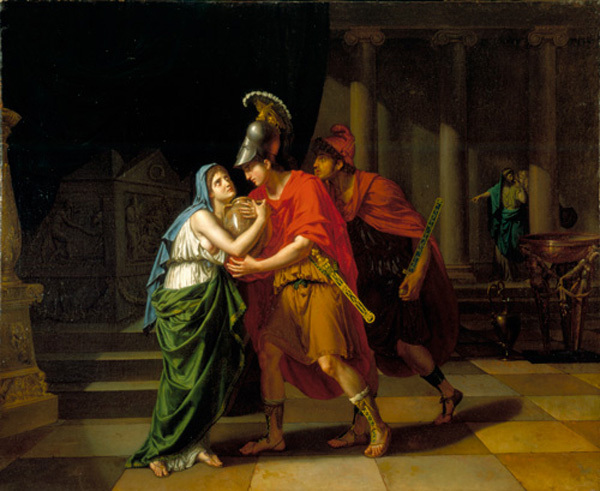 Sophocles's Electra inspired this work depicting an encounter between Electra and her brother, Orestes, whom she had believed to be dead. Bearing a funerary urn, he has returned in disguise to his homeland after an absence of many years to avenge the murder of his father, Agamemnon, whose tomb can be seen at the left. Clytemnestra, the mother of Electra and Orestes, who was responsible for her husband's death, appears at the far right with her lover, Aegisthus. A native of Lille, Wicar studied in Paris with the leading painter of the Neoclassical style, Jacques Louis David. By 1800 Wicar had settled in Rome, where he painted this picture for the French ambassador to that city.